The final season of The Mentalist is about to begin - and fans can at least be thankful that Patrick Jane and Teresa Lisbon are finally an official couple going into these last 13 episodes. But will their new romance bring about new challenges. We think the title of this episode bodes well for their future but with Teresa's former fiance returning to the office, we wonder if he'll be making trouble for Jisbon. 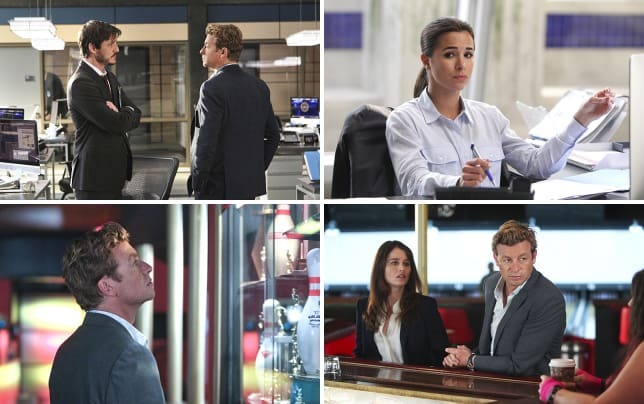 Check out these photos from The Mentalist Season 7 Episode 1 ("Nothing But Blue Skies"), which is scheduled to air Sunday, November 30th on CBS. Then, return for my detailed recap and review immediately after the premiere airs. Are you ready to say goodbye? The Mentalist Photos "Nothing But Blue Skies"
And if you need to get caught up, you can watch The Mentalist online right here at TV Fanatic. It's possible I was a tad hasty but you got my ire up. Permalink: It's possible I was a tad hasty but you got my ire up. 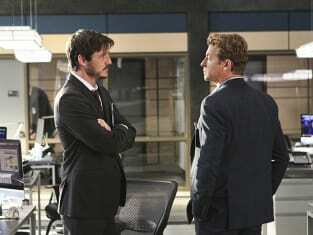 Lisbon: We should think about getting you a key to this place, don't you think? Jane: That's a step. It would make things easier. Permalink: That's a step. It would make things easier.